Enjoyable. But I wish The Joker weren't in it. It probably won't win over any new fans to the franchise. 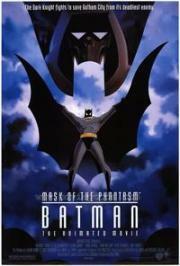 Mask of the Phantasm is dark, thrilling, beautifully animated and contains some of Mark Hamill's best Joker voice work. Jan 02, 2018 Faruk O. This 75-minute effort has drawn much praise from Caped Crusader fans but there's very little that sets it aside from any standard episode of the animated series. There are a couple of decent action sequences and Hamill's voice-work is as strong as ever, but it's completely predictable, features too many uninteresting flashbacks and, quite irksomely, never discloses the villain's fate at the end. BATMAN: MASK OF THE PHANTASM embraces its neo-noir roots in focusing on Bruce Wayne's doomed relationship with an old flame. The romance is treated with such depth and sensitivity, in fact, that it overshadows the mystery plot, which tends to rely on flashbacks and retcons of well-known origins. Even so, this is a BATMAN film that provides a more complete package--in tone, in character, in emotion--than most of its live-action contemporaries. Kevin Conroy is my Batman. No one else is better at being both Bruce Wayne and Batman. Let me just join the choir on this one: Definitely one of the very best Batman films out there. Perhaps the single best encapsulation of Batman in movie form. Engaging, dark, mysterious, exciting, and tragic - just as any good Batman story should be. Another very good Batman cartoon, although this one is definitely intended for children. I was impressed and surprised by the depth of the writing. Sure, the plot was pretty obvious from the start, but the writers deserve praise for successfully mining some actual themes and catharsis. The plot is rather enjoyable in its own slightly silly but dead serious sort of way, but otherwise there's not much here. The character relationships are too underdeveloped to carry their emotional weight and the animation is passable but no more. I was disappointed with the twists and the ending. Don't get me wrong, Mask of the Phantasm, being the cartoon serial turned to film that it is, doesn't quite belong on top of my chart. It's rather a tribute to the serie itself, which I consider an absolute masterpiece. The gritty, dense film noir atmosphere of the show, its unique "art deco-punk" universe, the freaking orchestral soundtrack, tear-jerking villain backstories and so on, simply make the Batman animated series the best kid's show I've ever watched.